You’re about to learn how to write a network engineer resume. And not just any network engineer resume. Make a stable and reliable connection with the employer of your dreams. Let’s start engineering it right away. A network engineer resume better than 9 out of 10 other resumes. How to write a network engineer resume that will land you more interviews. Tips and examples of how to put skills and achievements on a network engineer resume. How to prepare the best network engineering job description section on a resume to get any job you want. Here’s a network engineer resume sample made with our online resume builder. Sample Network Engineer Resume - See more templates and create your resume here. What’s the Best Format for a Network Engineer Resume? Of all available network engineer resume formats, there’s one that will make you truly stand out. What’s so special about this particular resume format? It puts your experience, achievements, and network engineer skills in the spotlight. And isn’t this exactly what you’d like to draw the recruiter’s attention to? It’s the resume format the vast majority of recruiters feel at home reading. It’s well organized, easily navigable, and conveys a lot. Just like a well-designed computer network should. So, the best resume format for an experienced network engineer is the reverse-chronological one. That being said, if you’re considering a career change you might also want to try out a combination resume. Avoid clutter and embrace white space. Write simple and reader-friendly headings. Save your network engineer resume as a PDF file. The PDF file type keeps the formatting intact on all systems and devices, and it’s readable to the ATS. Now, we can move on to the first section of your network engineer resume. Still unsure about the most suitable format for your network engineer resume? 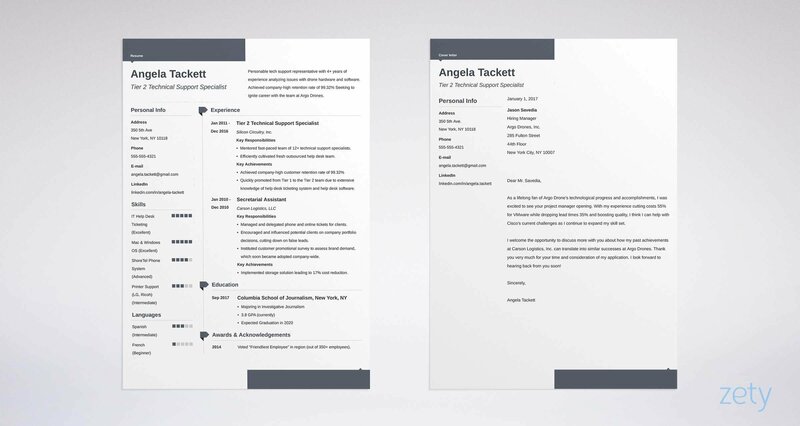 Read our guide: Best Resume Format: Which to Choose? Network Engineer Resume Objective or Summary? The most significant bit comes first. In your case, it’s the network engineer resume objective or summary. Because it’s the first thing the recruiter will lay their eyes on when scanning your network engineer resume. Plus, they’ll spend only 6 seconds looking at it. And you’re likely to have 250+ competitors vying for the same position. Your network engineer resume objective or summary must deliver from the word go. Before you learn how to get it just right, check out the difference between the resume objective and summary. Network engineer resume objective brings your skills to the foreground and shows the recruiter why you’re a perfect candidate. Resume objectives work best for those with limited professional experience. Network engineer resume summary, as the name suggests, sums up your professional experience and presents some of your greatest achievements. Skilled and well-organized USC graduate (GPA 3.9) with an MS in Electrical Engineering (Computer Networks). Eager to join Wintermute Corporation as a junior network engineer to help establish and maintain top-quality network performance. During a 3-month internship at SAIC gained experience in configuring switches, a good understanding of Nexus Operating System (NX-OS), and purpose and configuration of VLANs. A recent graduate with a degree in computer networks. Would love to join your company to keep developing his network engineering skills. Friendly and collaborative. It opens with the candidate’s strong character traits. Summarizes their education, and academic achievements in a couple of words. Identifies the employer by name. States what the candidate wants to help with. Describes the candidate’s previous experience. It offers numbers and refers to the network engineer skills the employer is after. More on that in the section on skills. In contrast, the wrong example doesn’t tell the recruiter much. It reads like a generic description that anybody could use. Strategically-minded and customer-oriented network engineer (1) with 5+ years of experience and in-depth knowledge of documenting network topologies, IP allocation, and network designs. (2) Eager to join Wintermute Corporation to help operate the company's data communications systems, as well as design and develop new business solutions. (3) In previous roles replaced Comware-based HPE equipment with Cisco (Cat 9000s) switches. Installed, patched, and configured 400+ switches, 1000+ APs, 10,000+ patch cords. Experienced network engineer wishing to join your company to keep developing professionally in a dynamic corporate environment. In-depth knowledge of network designs. Enthusiastic and motivated. Let’s take a look at the wrong example first. It doesn’t look that bad, but if you compare it to the right example you can see it’s substandard. Your resume will always be compared to the others, and our goal is to land you an interview. Specify what you can help with. Demonstrate your biggest skill(s) and achievement(s). There’s a gateway that will take your network engineer resume straight to the approved pile. A tailored network engineering resume job description will show the recruiter you’ve got exactly what they look for. Start with identifying the position that matches your level of experience and qualifications. Plan and recommend network hardware, systems management software, and design. Configure and maintain routers, switches, and network systems (including wireless and VoIP). Perform network systems tuning and recommend improvements. Evaluate new network products and monitor protocol capability. Partner with the security team to research and recommend secure network solutions to business problems and to prevent, detect, and investigate suspicious activity in a timely manner. Troubleshoot and resolve network hardware and software related issues. Install, configure and maintain network and data communications equipment and software. Monitor and evaluate network and data communications statistics to ensure timely upgrades and additions of hardware and software to meet growth requirements. The highlighted parts are the network engineer skills sought-after by the employer. It follows that your network engineer resume job description should focus on those exact skills. Make sure the phrasing you choose stays as close as possible to the original wording of the job ad. Troubleshooted, resolved, and recommended improvement for systems network and security problems at an advanced level across multiple/converged technology solutions services and platforms. Designed, integrated and maintained consolidated network services e.g. switches, routers, firewalls, wireless networks, and network security servers (incl. data center virtualization and storage software applications). Planned engineering architecture and the development of technical standards and interface applications. Performed capacity and resource planning to evaluate existing network systems to recommend resources and maintain or expand as necessary. Participated in researching and evaluation of new products and services. Prepared recommendations for implementation of new systems, procedures, and organizational changes. In the vast majority of cases, before your network engineer resume pops up on a recruiter’s screen it will have to go past the initial ATS scan. ATSs (Applicant Tracking Systems) are used by as many as 98% of Fortune 500 Companies. The ATS helps the recruiter separate the wheat from the chaff by identifying the network engineer resumes that meet the requirements stated in the job ad. They scan the resumes for keywords used in the job posting. The better the match, the higher up the list a given resume shows up. That’s the reason why your network engineer resume job description section must fall back on the language and phrases you see in the job ad. After all, it’s not the ATS that invites you to an interview. It’s the recruiter. If you thought simple copy-pasting will land you a job... you were mistaken. Try to present your experience in terms of achievements, not responsibilities. Achievements are your responsibilities backed up with numbers. In an ideal world, all your network engineer resume bullets should be quantified with percentages or numbers. But the truth is, it might be pretty hard to put a number everywhere. Identify up to three specific achievements and place them in a separate key achievements subsection under your responsibilities. Identified 15+ network vulnerabilities by manually and automatically testing infrastructure security, and implemented a Cisco 2100s with FTD platform to track potential threats to the network from firewall to the final destination on the network. Designed and implemented a new switch platform by replacing Comware-based HPE equipment with Cisco (Cat 9000s) switches to strengthen both the 802.1x-based NAC and security protocols. A network engineer resume job description like that will effectively block your chances. In other words, you’ll create a condition with no available paths to complete the recruitment circuit. What about the experience section on an entry-level network engineer resume? You shouldn’t leave the experience section empty. This is what you can consider including in a junior network engineer resume. All your internships count. They show you’re determined, willing to learn, and serious about your future career. And they make your jr network engineer resume look professional. Did you assist a friend with implementing a LAN at their small company? Do you help your family configure their wireless networks, set up routers, and firewalls? Include such experience in your entry-level network engineer resume. Show your willingness to act. You’re about to learn two things. You’ve already included some of the most important network engineer skills on your resume in the objective and job description. You’ll learn how to give your key skills even more prominence on your network engineer resume. As you see, the skills the employer is after are part and parcel of your network engineer job description. Well, your job description is based on the job listing the employer originally posted. Here’s how to give your network engineer skills even more visibility. Take a long hard look at the job ad again. See if the employer lists a set of specific technical or soft skills required of the candidates. If you have those skills, list them in a key skills section on your network engineer resume. Pro Tip: Don’t list more than 10 skills. Pick out the ones you’re great at, and leave out the ones you only have a basic grasp of entirely. This way you’ll avoid the so-called presenter’s paradox. Sprinkling them across your entire network engineer resume. Mention them in your network engineer objective or summary, job description, and key skills sections. Keeping the key skills section neat and organized. List a maximum of 10 skills. Stick to the ones you excel at. Presenting the relevant skills. Your list of skills cannot be just there. Double-check the job posting to be 100% sure you’re offering what the employer looks for. To land a network engineering position you need to have a proper educational background and the necessary network engineer qualifications. How to present all these on your network engineer resume in the most effective way? It all depends on how much professional experience you have. You present your education in a different way on a network engineer resume with 5 years of experience than on an entry-level resume. How About a Network Engineer Covering Letter? Writing a cover letter to accompany your network engineer resume may feel like trying to find a place for an ARPANET router in the TCP/IP architecture. Cover letters still matter—about 50% of recruiters expect them. And the last thing you want is not to deliver what the recruiter wants. Introduce yourself to the recruiter in a personalized way. Fill in all the blanks there might be on your network engineer resume. Write it in a clear and reader-friendly way. All this looks super simple in theory, but the moment you get down to writing your network engineer covering letter, your mind is likely to go blank. Head straight to our guide on how to write a perfect cover letter in 8 simple steps. Tailor your network engineer resume to fit the position you’re applying for. Start it with a snappy network engineer resume objective or summary. Prepare a meaningful and relevant network engineer job description section. Add metrics to your achievements to prove you’re good at what you do. Make sure your network engineer resume format is elegant and easily navigable. Are you writing a network engineer resume for the first time? Or perhaps you’re a seasoned network engineering pro eager to help the young guns out? We’d love to hear from you, leave your comment below!